The figure of Medea is one of the most famous female characters to appear in the tales of Greek mythology; for Medea was a central figure of the quest of the Golden Fleece, and the adventures of Jason and the Argonauts. ​Medea appears in the majority of the most famous ancient sources, including Argonautica by Apollonius Rhodius, Histories by Herodotus, Theogony by Hesiod, and Metamorphoses by Ovid. 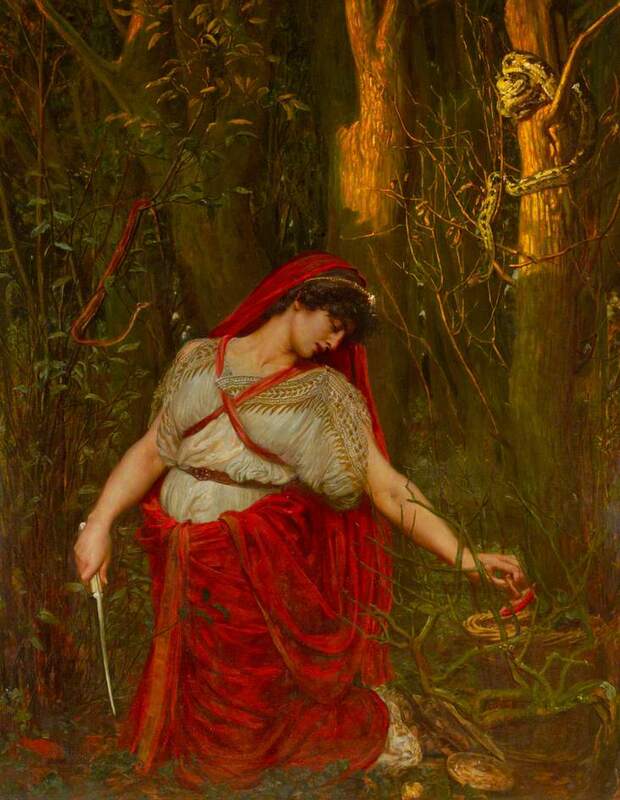 There were also several plays in antiquity dedicated to Medea, including Medea by Euripides. ​In these texts it was said that Medea was a princess of Colchis, for she was the daughter of King Aeetes born to his first wife, the Oceanid Idyia. Thus Medea had two siblings, or half-siblings, in the form of a sister, Calciope, and a brother, Apsyrtus. Being a daughter of Aeetes meant that Medea was a granddaughter of the Greek sun god Helios, and also a niece of Perses, and the sorceresses Pasiphae and Circe. Sorcery would flow through the female line, and in Colchis Medea was the priestess to the goddess Hecate, goddess of witches, and had skills equal to that her aunts. In the time when Medea was first talked of, the land of Colchis was at the furthest eastern extreme of the known world, a land of mystery and the uncivilised. Stories told of how Aeetes, who himself had originally come from Corinth, had transformed from a welcoming host, to one who strangers to death, after the arrival in his kingdom of Phrixus and the Golden Fleece. The transformation having occurred for it had been told to Aeetes that he would lose his kingdom if he allowed the Golden Fleece to leave Colchis. It was to Colchis that Jason and the Argonauts would sail, when Jason was tasked by Pelias to bring the Golden Fleece to Iolcus. Jason was a favoured mortal of Hera and Athena, and it was these two Olympian goddesses who enlisted the services of Aphrodite to ensure that Medea fell in love with Jason. 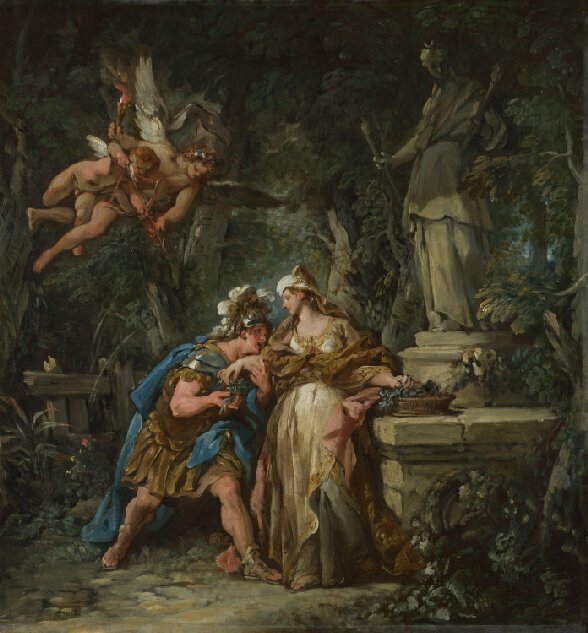 Medea would thus offer to help Jason in the removal of the Golden Fleece from the grove of Ares if he would promise to marry her; and of course, Jason readily agreed to marry Medea. Aeetes would set Jason a number of deadly tasks to ensure that the Golden Fleece remained in Colchis, but with each task, Medea would come to the aide of Jason. Thus, Medea helped Jason to yoke the fire breathing bulls of Aeetes, providing the Greek hero with a potion to prevent him from being burnt. Medea also told Jason how to ensure that the Spartoi, the warriors born from sown dragon’s teeth, killed each other, rather than Jason; and finally, it was Medea who put the Colchian dragon to sleep ensuring Jason could remove the Golden Fleece from its perch. Now a princess going against her father normally ended with the death of the daughter, as was the case with Scylla, daughter of Nisos, and Comaetho, daughter of Pterelaos, but in the case of Medea this was not the case, and Medea left Colchis on-board the Argo. Now for most people this would be where the story of Medea ends, for this is where the story does finish in Jason and the Argonauts the 1963 Colombia Pictures film, but this is but a fraction of the tale of Medea, and the story of the Colchian princess gets a lot darker in content. Aeetes, having discovered the theft of the Golden Fleece, dispatched the Colchian fleet in pursuit of the Argo, and it proved an impossible task for the Argo to outpace the whole fleet. Medea was then said to have concocted a plan that would delay the pursuit, and it was one that involved fratricide. Slowing the Argo, Medea allowed the lead vessel of the Colchian fleet, a ship commanded by Medea’s brother Apsyrtus to pull alongside. Apsyrtus was then allowed to come on-board the vessel of the Argonauts. In an unchivalrous act, Apsyrtus was then murdered, either by the hand of Medea, or by Jason, acting under the orders of Medea. The body of Apsyrtus was then cut up, and the individual body parts thrown overboard into the sea. Aeetes, who had by then caught up with his fleet, ordered his ships to slow down and collect the body parts of his son. ​This slowing of the Colchian fleet allowed the Argo to sail away. The journey back to Iolcus was a long and dangerous one; and had a number of stopping off points. One such stopping of point was on the island of Circe. Circe was of course Medea’s aunt, and it was said that Circe absolved Medea, and Jason, of the killing of Apsyrtus. A second stopping off point proved to be the island of Crete, and it was here that Medea perhaps helped saved the Argo and its crew. At the time Crete was protected by Talos, the bronze automaton, who circled around the island protecting it from invaders, and throwing rocks at unwanted ships. Medea, with the use of herbs and potions, disabled Talos, and perhaps, ensured that the lifeblood of the automaton drained away. ​It was also said that Jason kept his promise to Medea on the return journey, with Medea and Jason being married. The marriage of Medea and Jason was said to have occurred upon the island of Phaeacia, which at the time was ruled by King Alcinous. The Colchian fleet had once again caught up with the Argo, but as Queen Arete had married Medea and Jason, Alcinous would not give the pair up, and so the fleet of King Aeetes returned home, empty handed. Finally, the Argo, carrying Jason, Medea and the Argonauts returned to Iolcus, much to the angst of King Pelias, who had presumed the quest would be a deadly one to Jason. Jason though, had succeeded just as Hera had planned, for the gods of Mount Olympus were seeking to punish Pelias; and ultimately Medea was being manipulated by the gods, just as she had been when she had first fallen in love with Jason. Named as the Curse of Pelias, it was the ultimate aim of the gods to see Pelias die through the work of Medea. Pelias did not immediately relinquish the throne of Iolcus, as he had promised if Jason was successful in his quest, and Medea began to work on the daughters of the king. Medea showed she could rejuvenate an old sheep, transforming it into a young lamb, by cutting it up, putting it into a cauldron, and then applying herbs to the cauldron; Medea would promise that she could make Pelias young once again by the same method. Thus, the daughters of King Pelias, cut up their own father, and placed the bits of body into a cauldron, but of course a young King Pelias did not emerge, all that the daughters had achieved was the murder of their own father. Some tell though of Medea did rejuvenate Aeson, the father of Jason, although in most cases it was said that Aeson was dead by the time his son returned to Iolcus. Jason and Medea would not benefit from the death of King Pelias, for Acastus, the son of Pelias succeeded his father to the throne. Despite Medea being responsible for the death of Pelias, she could not be tried for murder, for it was Acastus’ own sisters who had done the deed. But, Acastus did exile Medea and Jason, forbidding them from returning to Iolcus. Medea and Jason would make a new home for themselves in Corinth, a city where they stayed for perhaps as long as 10 years. Medea would give birth to a number of children by Jason, anywhere from two to six children. Where it is said that Medea had two children, then these were sons, Mermerus and Pheres, but if Medea had six children then there were five sons, Memerus, Pheres, Alcimenes, Thessalus and Tisandrus, and one daughter, Eriopis. Still, Medea and Jason were not to live out their lives happily in Corinth. It is commonly said that Jason began to tire of being married to Medea, for in Corinth Medea was perceived to be a barbarian, as were all those who came from Colchis. To make a better life for himself it was arranged that Jason would marry Glauce, the daughter of King Creon of Corinth. Now how Jason expected the sorceress Medea to take this engagement is unknown, but Medea reacted just as everyone else expected her to, with murderous intent. 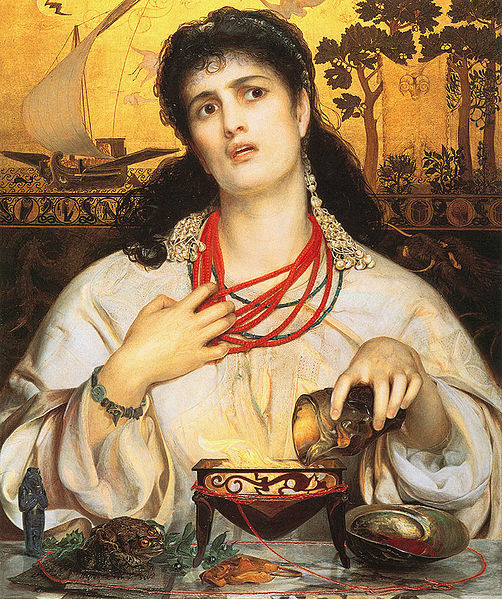 ​Medea developed a deadly potion and then covered a robe with this poison, before secretly sending this robe to Glauce. Taken by the beauty of the robe, and of course unaware of its deadly covering, Glauce put the robe on, but immediately poison soaked into her skin, causing her to cry out in pain. King Creon heard the screams of his daughter, and attempted to remove the robe, but in grabbing hold if it, Creon killed himself for poison also started to race through him. Having killed Jason’s intended, Medea now to sought to inflict more pain upon Jason, for it was said that the Colchian sorceress killed her own sons, Memerus and Pheres; some say the other children, bar Thessalus, met the same fate, although it is not clear in ancient text. Now some tell of how Medea did not commit filicide, with the death of Medea and Jason’s children be undertaken instead by the people of Corinth in revenge for the death of their king. Nevertheless, Medea would now flee from Corinth without Jason, and some tell of how she called forth a chariot pulled by two dragons to aide her escape. ​Medea was said to have travelled to Athens, which at the time was ruled by King Aegeus. Aegeus has desperately tried to produce a male heir for many years, in order that he could pass on the Athenian throne to his son. Medea would work on this desire of King Aegeus, and very quickly Medea and Aegeus would wed, for the sorceress had promised that a male son would be forthcoming. Medea would keep her word, for Aegeus was subsequently said to have become father to a son, Medus; although some claim that Medus was a son of Jason, conceived before Medea’s flight from Corinth. Medea might have been queen of Athens, but there was to be no respite, for Aegeus had previously fathered a son, Theseus, although the king was unaware of the fact. ​When of age, Theseus arrived in Athens, although Aegeus did not immediately recognise his own son. Medea though did recognise the stranger for who he was, and realised that if Theseus was allowed to live, then Medus would not be ascending to the throne of Athens. Thus Medea quickly convinced Aegeus to send the stranger on a quest to capture the Marathonian Bull. The Marathonian Bull, which had previously been captured by Heracles, when it was known as the Cretan Bull, was causing death and destruction in the countryside around Athens. Theseus proved to be the equal of Heracles in this quest, and the son of Aegeus returns to Athens with the bull ready for a sacrifice to be made to the gods. 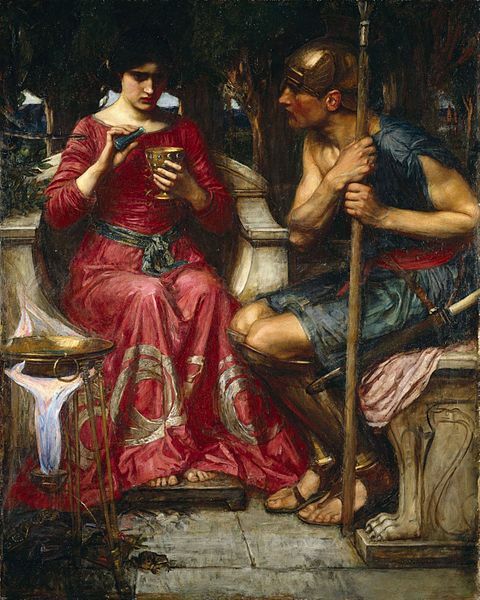 Medea has another go at killing Theseus, and convincing Aegeus that the stranger is a threat to the throne, makes up a poison for him to drink. Before Theseus drinks from the poisoned chalice though, Aegeus finally recognises the sword that Theseus is in possession of, and dashes the chalice aside. Medea is thus forced to leave her home once again, this time taking flight with Medus in tow. ​There was nowhere left in Greece that would welcome Medea now, and so Medea decides to return to her first home Colchis. Colchis has changed greatly since Medea had first left, and Aeetes had lost the throne after the loss of the Golden Fleece, just as had been prophesised; his own brothers, Perse, had usurped Aeetes. Medea would intervene to ensure that Aeetes was once again king, and thus through her sorcery, Perses is killed, and Aeetes is restored to the Colchian throne. Aeetes would eventually die, but then Medus, Medea’s own son becomes king of Colchis, and the story of Medea ends.